The Volkssport clubs of Alberta have 71 PTs across the province. This makes a compelling reason for out of town walkers to visit Alberta for a few weeks and experience some terrific walking. Some walks are only open at certain times of the year so check the dates first and also check if there is a walk box or if it's a mail in. Mail Ins have no local walk box so the instructions need to be printed/downloaded first and the registration and stamping is carried out by mail or electronically. Directions to the walk start point, ratings, route directions, contact person and other information relating to these events can be found below and in the annual calendar. Many PTs have multiple routes so if printing them off be careful to select the correct route if you are trying to complete a special program. VAA is very proud of the walks in Alberta and would love to add more each year. If you have an idea for a new route contact us and hopefully we can make it happen. Barrhead, Red Deer and Medicine Hat organize group walks during the week. If you are in their area please contact them to join the group walk. This new PT in beautiful Airdrie follows the city trail system as they wind along creeks and streams. TRAIL Paved trails and sidewalks through town of Airdrie. MISC. Washrooms and ample parking at Genesis Place. The in town PT is an easy walk that takes you to the Banff Springs Hotel, through downtown Banff, and lovely Cascade Gardens. The PT is available for the entire year from the Jump Start Cafe, 210 Buffalo St. Rated 1B. The town has identified a number of historic sites with information plaques Rated 2B. This in town route takes you to the Banff Springs Hotel and lovely Cascade Gardens using trails and roads. Rated 1B. DISTANCES: Multiple distances see instructions. MISC. National Park Pass required. Walk Box is kept on top of the fridge. Public washrooms available across street. Free parking. This mountain is named after the Sulphur Hot Springs. The route consists of a steep switchback trail suitable for the more experienced walkers. A person could ride the gondola down rather than walking the return trip. And yes, you do walk to the summit of the mountain in this picture!! This walk is 5.5 km one-way, with an elevation gain of 742 m. Once you reach the top of Sulphur Mountain you can get to Sanson Peak via the short walkway. If you want to get into peak bagging here is a chance to bag a second without much additional effort. At the top of Sulphur the view is 360 degrees of fantastic with a view of the Banff town site and valley, Mount Rundle and the Sundance Range. TRAIL Trail switchbacks up to the peak of Sulphur Mountain, fantastic views from top. MISC. National Park Pass required. Washrooms available at Start Point. TRAIL Through town to the beautiful trail beside the river to the Hoodoos. This walk takes you to the summit of Tunnel Mountain with breath taking views of the town of Banff. Although only 5500 feet in altitude above sea level, the summit is a magnificent viewpoint, covering the Bow River Valley both east and west. TRAIL Five km around town, including Banff Centre. Five km return trip to the peak of Tunnel Mountain. A vibrant town of just over 4500 people, just over an hour north west of Edmonton. Barrhead is nestled along side the Paddle River. START POINT Barrmart Foods, 5108-55 St. TRAIL Around the outskirts of the Town of Barrhead on paved & gravel trails, ravine and along the river. The thriving community of Beaumont is just outside the City of Edmonton's SE border. It is 30 minutes from downtown Edmonton. TRAIL Walk on paved trails around town and Don Sparrow Lake. MISC. Washrooms available at start. The PT follows the Elbow River and goes through some very upscale housing neighborhoods. The PT opens January 1st for the entire year from the Repsol Sports Centre, 2225 McLeod Trail S, Calgary. MISC. Plenty of free parking. Ask for the walk box at the service desk opposite the indoor track. Washrooms available at the Start Point. Route A & B start from the Repsol Sports Centre while routes C & D start downtown. You will need to register and then drive to the start for the latter (directions are on the route instructions). 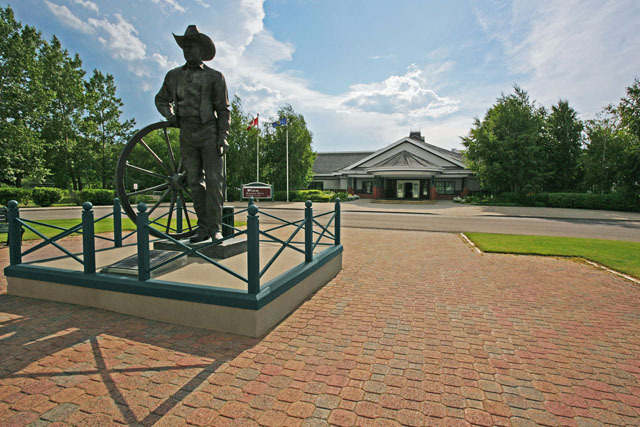 Camrose is a scenic community with many parks, leading to its moniker "The Rose City". Camrose a small city of over 18,000 people offers a relaxed lifestyle. The town of Canmore borders Banff National Park. It is surrounded by mountains making it one of the most impressive mountain towns in the world. The PT route follows the Bow River and provides excellent views of the Three Sisters Mountains. Route A: Explores a section of downtown, up the hill into wooded area, old train bridge along the Bow River then out to golf course. Route B: Explores the same area as Route C with the addition of the other side of the Bow River and old train bridge. Route C: Explores Policeman's Creek, main street, Bow River out to golf course. Route D: Explores Policeman's Creek, downtown and along the Bow River to old train bridge. MISC. Washrooms available at start point. The town of Cardston was founded in 1887 and has a population of just over 3500. It is situated 77 Km southwest of Lethbridge and 25 km north of Montana. REGISTRATION 5:00 AM to dusk. Walk daylight hours only. MISC. Ask for Walk Box. Parking and washrooms available at Start Point. The Remington Carriage Museum has the largest collection of horse drawn vehicles in North America. Open seven days a week with carriage rentals and rides available. REGISTRATION 9:00 AM - 4:00 PM. Closed Easter Sunday and Dec 24 & 25. MISC. Ask for Walk Box at registration desk. Parking and washrooms available at Start Point. The town is located 18 km west of the Calgary city limits along Highway 1A. With a population of 26,320, Cochrane is the second largest town in Alberta and one of the fastest growing communities in Canada. The town is surrounded by Rocky View County. TRAIL Dawn to Dusk. Choice of routes. MISC. Washrooms available at Start Point and along some routes. The city of Cold Lake has a population almost 15,000. The lake is one of Alberta’s largest and deepest lakes (the 7th largest in the province to be exact) and provides endless opportunities for fishing, boating and camping. TRAIL 10 km walk goes through Cold Lake Provincial Park following trails through the park and campsite. 6 Km route tours downtown and marina. MISC. No fee to enter park. Camping available. 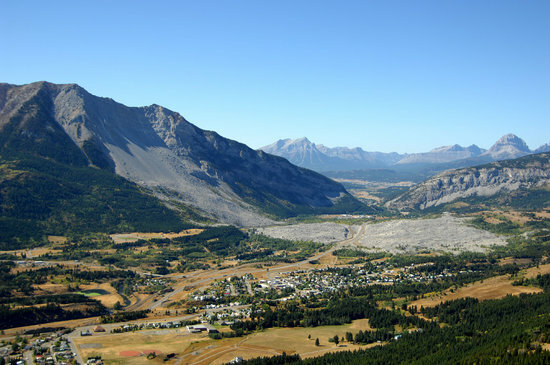 Frank is a small community of 85, which was amalgamated with 4 other communities in 1979 to form the municipality of Crowsnest Pass. It's known for the tragedy that struck in 1903, when the tip of Turtle Mountain broke loose and decimated part of the Village of Frank. The Wilderness Trail tours the slide area. TRAIL Choice of in-town and wilderness trails. MISC. Washrooms available at start points. Devon is a town with a population of just over 6500. Situated 26 kilometres southwest of Edmonton, the provincial capital, and located along the banks of the North Saskatchewan River. TRAIL Walk on paved and multi-use trails in the town. The town of Drumheller, within the Red Deer River valley in the badlands, is located 110 km northeast of Calgary. The Drumheller portion of the Red Deer River valley is often referred to as Dinosaur Valley, because of the many fossils found there. TRAIL Sidewalks and paved trails. REGISTRATION Dawn to Dusk, 7 days a week. MISC. Ample parking. Washrooms and some food services available inside Sports Centre. This is a favourite walk for locals in the winter and also for visitors as they can tour West Edmonton Mall at the same time. If you want to walk without dodging people it is recommended that you start early enough to be done before the stores open. REGISTRATION 7 am to 9 pm. MISC. Name change of business. This walk starts from the Kinsmen Sport Centre in the beautiful North Saskatchewan River valley. Route B goes through the U of A then along river valley trails. Parts of the trail are subject to freezing due to springs in bank. It suggested that you walk this trail in the summer months. Route A follows sidewalks in the residential section of Wolf Willow. Beautiful expensive homes line the route. This route is an all season walk. Route B follows the sidewalks of Wolf Willow and the Multi Use trails of the surrounding ravines. It is best walked in the spring, summer and fall. Route C This walk is similar to Route B except you get to cross a fabulous Pedestrian Bridge and walk up a flight of 200 steps! Route D & E 5 Km These routes follows sidewalks in the residential section of Wolf Willow. Beautiful expensive homes line the route. These routes are all season walks. Route F 5 Km Indoor track at Jamie Platz YMCA. Admission fee to use the track. Routes A & B - wind down into the beautiful North Saskatchewan river valley. Route C - is the least strenuous and tours residential areas. Route D & E - have a mixture of residential and pathways with both routes overlooking the North Saskatchewan River as the trail winds along the top of the bank, almost to the Henday Bridge. Fantastic views and great trails. REGISTRATION Dawn to dusk. Walk Box at customer service desk. TRAIL see descriptions to left. MISC. Route A & B aren't stroller friendly and go through an off leash dog area. Other routes are stroller friendly. This PT is based in North Edmonton and offers a choice of interesting routes. Route A - Goes around beautiful Beaumaris Lake and residential/park areas. Route B - Stays around the lake, perfect when sidewalks are icy. Route C - Explores the new military commemorative park areas in Griesbach, the old army base. MISC. Washrooms available inside the YMCA. This walk starts from the William Lutsky South Edmonton YMCA and winds through the Black Mud Creek trails and the sidewalks of Twin Brooks passing many beautiful yards and houses. TRAIL Trails and sidewalks around Twin Brooks and the Blackmud Creek. MISC. Washrooms available inside the YMCA. Parking available. See some of the most luxuriant homes in Edmonton with 5 and 6 car garages. TRAIL Walk past the most luxuriant homes in the region with 5 & 6 car garages. This walk goes by a number of man-made lakes and on all new trails. TRAIL This walk goes by a number of man-made lakes and on all new trails. MISC. Ample parking and washrooms available at start point. A city located 25 km northeast of Edmonton, along the North Saskatchewan River. The population is over 25,500. Route A uses mainly paved trails around the Northeast part of town. Route B uses trails plus goes downtown. Route C uses trails plus goes downtown. TRAIL Dawn to dusk, see descriptions at left. In 1875, under the command of Inspector W.D. Jarvis, the North-West Mounted Police established Fort Saskatchewan as a fort on the North Saskatchewan River. The community was later incorporated as a village in 1899, a town in 1904, and a city in 1985. Route A is the summer route and uses both paved and unpaved routes. Route D uses paved trails through park areas, not part of the Trans Canada Trail program. Fox Creek is located on Highway 43, approximately 259 km northwest of Edmonton. It was founded in 1971 and has a population of just over 2000. TRAIL Walk through the residential area on paved trails and sidewalks. Suitable for strollers. MISC. Pets must be leashed and picked up after. Park facing Kaybob Dr. on left side of Station front door. 68,500 it is located approximately 456 km northwest of Edmonton. TRAIL Paved trail and some sidewalk. MISC. Stroller friendly. All facilities at Pavilion. Ample parking on weekdays, more parking to the south if necessary. The town of Hinton is located 81 km northeast of Jasper and about 284 km west of Edmonton, its population is close to 10,000. TRAIL Paved trails, boardwalk, and dirt paths. MISC. Washrooms not available at Start Point. The town of Innisfail is located in Central Alberta on Hwy #2 about 30 km south of Red Deer, its population is close to 8,000. It is the commercial centre of Jasper National Park, located in the Canadian Rockies in the Athabasca River valley. Jasper is approximately 362 km west of Edmonton and 290 km north of Banff. TRAIL Walk follows “Discovery Trail” up the slopes behind and around Jasper. MISC. National Park Pass required. Washrooms available on route. Free parking on street. Route A is in town. TRAIL See descriptions on left. MISC. National Park Pass required. Washrooms available on route. Established in 1813, Jasper House was first a North West Company, and later Hudson's Bay Company, fur trade outpost on the York Factory Express trade route to British Columbia. The route follows the river and there are views into the canyon from the trail. You must register at Totem Sports and then drive out to Maligne Canyon. NOTE: Register at Ski Shop and drive to Start Point. TRAIL Winds along and over bridges crossing deep canyon of Maligne River. MISC. National Park Pass required. Sign in at Totem Ski Shop and drive to Maligne Canyon Restaurant & Gift Shop. Parking and washrooms available. This is one of the most popular walks in all the Rocky Mountains. The first 5 km (return) passes through a narrow canyon in which you will see two spectacular waterfalls. If you are up to seeing something very unique continue on up through the forest to the Ink Pots in Johnston Valley. (12 km return). The Ink Pots are six clear greenish pools filled with spring water that remains at a constant 1-degree Celsius year-round. TRAIL The first part of the trail walks through the majestic canyon past 2 waterfalls. The second part is up hill all the way to the Ink Pots. Great getaway from the busy urban environment into a truly natural surrounding of forest and wildlife. CVF PROGRAM: MURALS on routes C & D.
The route walks along beautiful Lake Louise and then the 12 km continues up a steep climb to Lake Agnes. This walk is at a very high altitude and may be closed if the snow melt is late. These mountains aren't upside down, this is the reflection in the lake! Perhaps the most beautiful walk in the Rockies. TRAIL see description at left. Leduc is a city of just over 31,000. Located 33 km south of Edmonton on the Queen E Highway. TRAIL Around town on sidewalks and paved trails of park area. MISC. Washrooms and food available at start point. Leduc was first established in 1899, when Robert Telford, a settler, bought land near a lake which would later bear his name. It was on that piece of land where the new settlement would take root. TRAIL Around the west side of town on sidewalks and paved trails. NOTE: Register at Inn and drive to Start Point. Route B, C & D - 1A. TRAIL In river valley. 10 km walk includes stairs. MISC. Ask for Walk Box at Inn registration desk. Medicine Hat is a city of 63,018 people in southeast Alberta, Canada. It is approximately 169 km east of Lethbridge and 295 km southeast of Calgary. REGISTRATION 8:00 AM to dusk. TRAIL Residential streets, red shale and asphalt trails and parks. MISC. Trail goes through some of the most scenic parks in Canada. Expect an abundance of wildlife. The name "Medicine Hat" is the English translation of 'Saamis' (SA-MUS) – the Blackfoot word for the eagle tail feather headdress worn by medicine men – or 'Medicine Hat'. Prior to the arrival of Europeans the Blackfoot, Cree and Assiniboine nations used the area for hundreds of years. TRAIL Residential streets, red shale and asphalt trails. MISC. Enjoy the trails and streets of historic Medicine Hat. Note of Interest: downtown streets are lit by gas lamps. In 1883, when the Canadian Pacific Railway (CPR) reached Medicine Hat and crossed the river a town site was established using the name from the Indian legends. TRAIL Residential streets, red shale and asphalt trails, stairs, and parks. MISC. Trail goes along the river and through several parks. TRAIL Sidewalks and asphalt trails through parks and urban areas. Some shale and stairs. MISC. Pick up directions from Walk Box and then drive to Crescent Heights Leisure Centre (2000 Division Ave. N.). Washrooms available at start and finish points. Plenty of parking. Redcliff is situated at a high elevation relative to the surrounding landscape, the Town of Redcliff offers views of the South Saskatchewan River valley, the City of Medicine Hat, and Cypress Hills. The cliffs that overlook the river valley resemble badland formations. TRAIL Sidewalks, paved and red shale trails. MISC. Pick up directions from Walk Box and then drive to Redcliff Riverview Golf Course, 700 Redcliff Way, Redcliff T0J 2P0 Washrooms available at start and finish points. Plenty of parking. 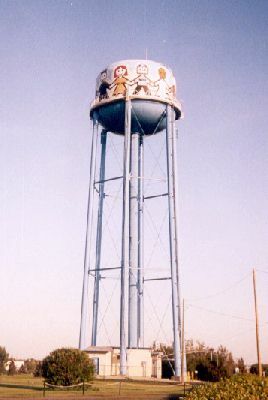 Millet in a town is located approximately 40 km south of Edmonton. The town has won nationally in the Communities in Bloom competition and markets its beautiful setting. With a population of just over 2090. TRAIL Along shale paths in park and along streets of Millet. This is a glacially-fed lake in Banff National Park, 14 km outside the Village of Lake Louise. It is situated in the Valley of the Ten Peaks, at an elevation of approximately 6,183 feet. The lake, being glacially fed, does not reach its crest until mid to late June. When it is full, it reflects a distinct shade of blue. The color is due to the refraction of light off the rock flour deposited in the lake on a continual basis. TRAIL The 5 km part of the trail is along the shores of Moraine Lake. The 10 km part takes you up the mountain to Consolation Lakes. MISC. National Park Pass required. The Consolation Lakes trail requires walkers to be in groups of 4 or more and carry bear spray, July to September. Washrooms available at Start Point. The town of Morinville is located 34 km north of Edmonton. The walk starts from the Morinville Shell and winds around wilderness trails and town sidewalks. There is an alternate route in Legal, another 9 km north of Morinville, the alternate has many murals. REGISTRATION Mail in registration. No Walk Box. TRAIL Mainly trails and residential streets. MISC. Alternate route in Legal. See the 35 murals that celebrate Legal’s French heritage. Register in Morinville. Another beautiful Alberta town situated 18 km south of Calgary. with a population of over 28,880. The route goes along the Sheep River and explores the downtown. TRAIL Dawn to dusk. Route follows the Sheep River as it winds through town and along the historic streets of the Olde Town District. MISC. Washrooms available at start point and on route. START POINT Kerry Wood Nature Center 6300 45 Ave.
MISC. Use overflow parking. Washrooms available at Start Point Year round 1000-1700; Summer 1000-2000; Holidays 1300-1700 Closed Christmas Day. The city is located in aspen parkland, a region of rolling hills that is home to oil, grain, and cattle production. It is a centre for oil and agriculture distribution. MISC. Washrooms available during business hours. Sherwood Park is the largest hamlet in Alberta with 70,618 residents. located on the Eastern boundary of Edmonton. Route A - Ball Lake - This walk starts from Park Centre & Hotel (previously Franklin's Inn) and crosses Ball Lake to an Island, by some very nice residential homes and then through Heritage Hills wetlands. 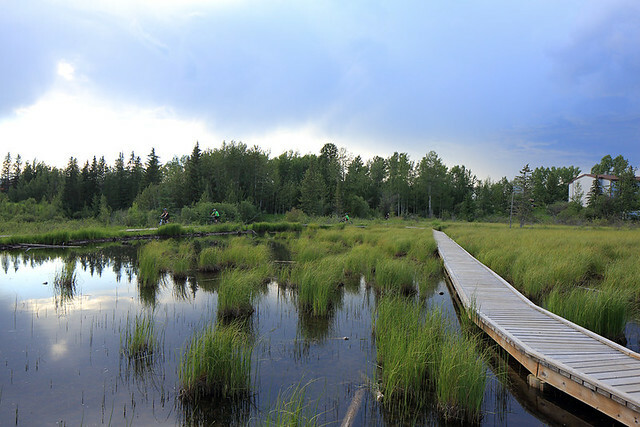 Route C - This walk starts from the Strathcona Wilderness Centre after registering at Park Centre & Hotel you must drive to the centre which is located 20 minutes east of Sherwood Park on Township Road 530 (Baseline Rd.). The route winds around the wooded wilderness trails where moose and deer are frequently seen. REGISTRATION Dawn to dusk with ample parking. In 1953, permission was received from the Municipal District of Strathcona for the development of the residential hamlet named "Campbelltown" and in September 1955, the first model homes were opened to the public. Later in 1956, the name of the hamlet was changed to Sherwood Park, because Canada Post would not approve Campbelltown, since there were several Canadian communities with similar names. Route A - This route takes you to the only covered bridge in the Edmonton area and around a beautiful lake in Broadmoor Park. Route C - Walk Inside at Millennium Place - Drive to Millennium Place at 2000 Premier Way in Sherwood Park and walk around the indoor track 43 times for a 10 km or 22 times for a 5 km walk. An admission fee is required. The thriving community of St Albert, with a population of 64,645, is adjacent to the City of Edmonton's NW border. 5 Km options - these include 4 different walk options. Due to construction route A is not currently available. There is a 6km revised route available in the walk box. REGISTRATION Ask staff for Walk Box. St. Albert was founded in 1861 by Father Albert Lacombe, who built a small chapel: the Father Lacombe Chapel in the Sturgeon River valley. This chapel still stands to this day on Mission Hill. St. Albert first received its town status in 1904 and became a city in 1977. Route A - 10 Km Art and History. Starts at St Albert Inn. Route B - 10 Km Art and History. Starts at St Albert Place. TRAIL See walk descriptions on left. MISC. This is the St. Albert HISTORICAL walk. Route A - 10 Km walks around nice residential neighborhoods and along the Sturgeon River. Route B- 10 Km winds around the northern residential parts of St Albert. Route C - 5 Km is a very scenic route through the northern part of St Albert. TRAIL On paved trails and sidewalks. Route A: 10 km through both east and west trails of River Lot 56 and residential streets. Route B: 6 km through River Lot 56 east side. Route C: 5, 6, 10km Indoor track available on third floor. Admission fee to use the track. Route D: 5, 6, 10 km Cross Country Ski. Refer to maps on trail heads of River Lot 56. One location Poundmaker Road, second location Kingswood Day Area. Make you own route for the distance you require. Route E: 5 & 10 km route, mainly on sidewalks and trails. Great for when River Lot is icy or too many mosquitoes. The Northern Alberta International Children's Festival in St. Albert is one of the longest-running children's festivals in North America, attracting over 40,000 participants over 5 days, at the end of May. During the five days of the Festival, children experience sights and sounds of many different cultures while learning through the medium nearest and dearest to their hearts - by playing! TRAIL Residential areas and along the trails of Red Willow Park. MISC. Take time to visit City Hall, St. Albert Place designed by Douglas Cardinal, and the original Mission on the hill. This city of nearly 34,900 is located 11 km west of Edmonton along Highway 16 or Highway 16A. TRAIL Paved trails and sidewalks through forest, parks and residential areas. This town of 15,000 is located west of Edmonton adjacent to the City of Spruce Grove. 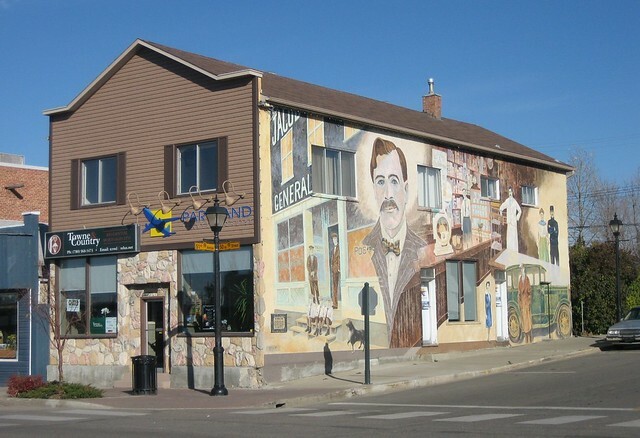 Stony Plain is known as "The Town with the Painted Past" due to the amount of painted murals. The town was originally known as Dog Rump Creek. REGISTRATION Open 24 hours. Ask at service desk for walk box. TRAIL An easy walk through town to view murals and on park trails. Stroller friendly. Please park well away from store. ROUTE A/C: route A plus treed MUT and walks parallel to the Railroad tracks. A very pleasant walk on multi-use trails and sidewalks through some of the residential and downtown and around the golf course. A nice stroll through parks and sidewalks. The 10 km has a short stretch through a nature area. In the heart of Waterton National Park is the Village. It's scenically located on a small delta which is closely guarded by the Rocky Mountains to the north and west and Upper Waterton Lake to the east and south. Waterton Village is 56 km west of Cardston on Hwy 5. TRAIL Paved and gravel trails along lakeshore through woods and town. Watch for wildlife. MISC. National Park pass required. Free parking on streets. Public washrooms available throughout park. A small city of 12,655, located 70 km south of Edmonton. The city name comes from the Cree word wītaskīwin-ispatinaw, meaning "the hills where peace was made". MISC. Please clean up after dogs. This town of just over 10,200 is located approximately 180 km northwest of Edmonton. START POINT Information Centre 3002-33 St.